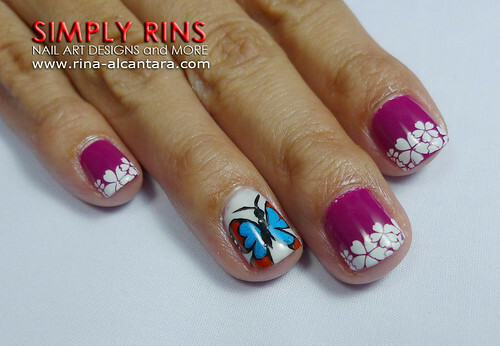 Based on my timezone *grins*, Mother's Day is tomorrow and I'm dedicating this butterflies and flowers nail art design to my Nanay (mother) who have been unconditionally supportive of me and my love for the arts! Mother's Day happens in the Philippines and in some countries every first Sunday of May. Others celebrate it on February, March, or April. If you are curious to find out when Mother's Day is celebrated in other parts of the world, you may check it here. I have for you butterflies and flowers as a nail design for Mother's Day. I used 2 coats of Orly Samba as base coat and Essie Marshmallow for the accent nails. The 2 butterflies were painted using acrylic. 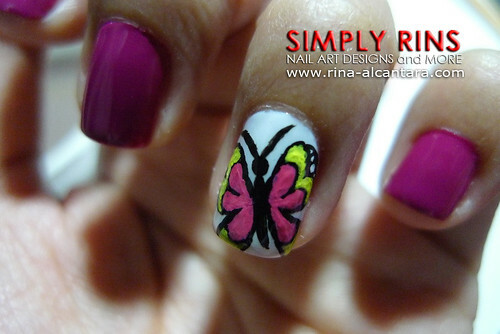 I photographed how I painted the butterflies and hopefully you will be able to get some tips on nail painting. 1. 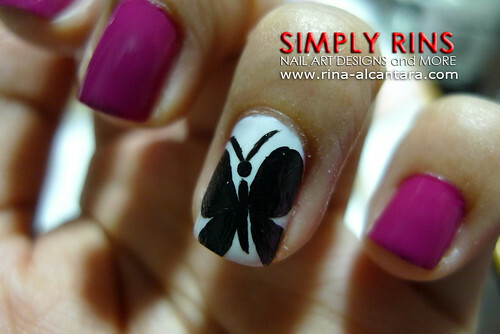 First, I painted the shape of the butterfly using black acrylic. I did this first because I intended my butterfly to have an outline and this method is easier than drawing your outline last. You will have a better idea of what I mean on the next photo. 2. With your preferred color, paint your butterfly. The design is completely up to you. 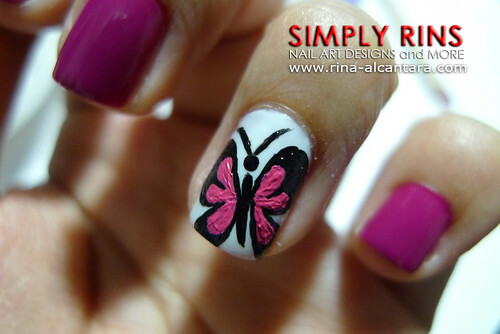 For this nail design, I chose pink as the dominant color of my butterfly. Carefully paint the details, making sure you leave a thin portion for the black color to create that outline. 3. If you decide to have a colorful butterfly, go ahead and paint the details. Remember to keep a little of the black color for your outline. 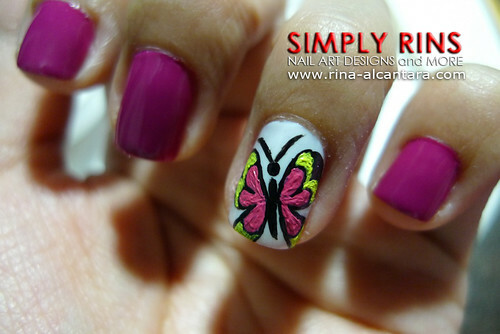 For this nail art, I used yellow as a second color for my butterfly. 4. I added white dots on the tip of the wings for further details. Finally, seal your design with a good top coat. I am currently using Seche Vite Fast Dry Top Coat that I was able to purchase locally through Digital Traincase. I was supposed to leave the other nails plainly but I figured my butterflies need flowers so I stamped an image from Bundle Monster BM11 plate to create flower tips. I also did Nanay's nails! Flower nail design for my Nanay! I'm ending this post with a greeting, "Happy Mother's Day!" 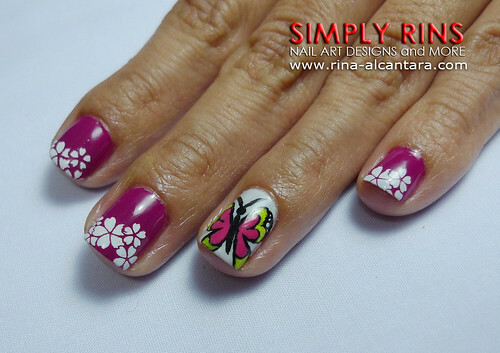 lovely butterflies :) Ilove that you can do your mothers nails! Here in Denmark it's mothers day tomorrow too, but in my family we don't really celebrate these kind of holidays..
Love it. I really like your tutorials. Learning a lot from you. Thanks! Mother's Day is tomorrow here in the States, too. Happy Mother's Day to your Nanay. Fun! I like the butterflies, they almost look comic-book-ish or something.